HorsePower builds a new-age Hemi with old school carburation and supercharging. (ANNOUNCER)>> WHAT HAPPENS WHEN YOU MARRY A NEW AGE HEMI WITH AN OLD SCHOOL BAD BOY SUPER CHARGER? THE BUILD UP, THE BLOWER, AND THE DYNO BLOW OUT ARE ALL ON TODAY'S HORSEPOWER. 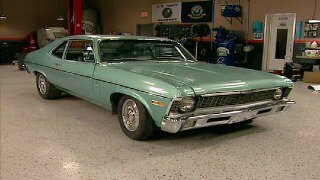 (JOE)>> SAY, WHAT COULD BE BETTER THAN A 426 HEMI? 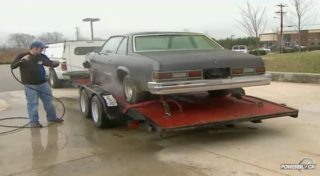 WELL HOW ABOUT ONE THAT'S BUILT WITH A COMBINATION OF NEW AGE TECHNOLOGY AND OLD SCHOOL MUSCLE? THAT'S WHAT WE'RE UP TO TODAY. 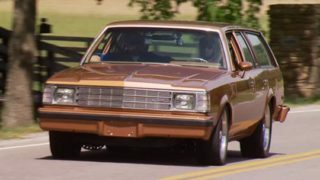 AS YOU MIGHT HAVE SEEN RECENTLY, OUR MUSCLE CAR FRIENDS BOUGHT A '74 DODGE DART TO MODIFY FOR SOME OVER THE TOP STREET/STRIP DUTY. NOW IT NEEDS AN ENGINE, LIKE THIS ONE ALMOST. IT'S A SUPER CHARGED HEMI FROM ARRINGTON PERFORMANCE, A COMPANY THAT SPECIALIZES IN INNOVATIVE NEW AGE HEMI ENGINES AND PARTS. OUR PARTS PACKAGE FOR THE DART WAS PRETTY MUCH THE SAME BUT ADDING A UNIQUE TOUCH OF NOSTALGIA AND OLD SCHOOL PERFORMANCE. WE'RE FEEDING IT WITH A WEIAND ROOTS STYLE 871 SUPER CHARGER AND A PAIR OF 950 HP HOLLEY BLOWER CARBS. THE FOUNDATION IS A NEW FACTORY BLOCK FRESH FROM 40 PLUS HOURS OF WORK AT ARRINGTON. SINCE THE EARLIER DAYS OF NASCAR, THIS COMPANY'S BEEN AT THE FOREFRONT OF HEMI ENGINE DEVELOPMENT. 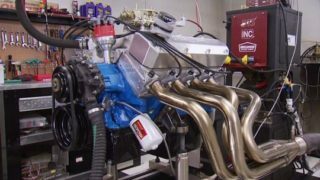 ARRINGTON PERFORMANCE NOW SPECIALIZES IN BUILDING EFI THIRD GENERATION HEMI ENGINES, AS WELL AS COMPONENTS FOR RACING AND STREET USE. (ERIC)>> ONE OF THE THINGS THAT WE REALLY EMPHASIZE AT ARRINGTON IS SPENDING THE MAN HOURS IN DEVELOPMENT. (JOE)>> OUR BLOCK WAS THOROUGHLY CLEANED, DEBURRED, AND STROKER CLEARANCED BEFORE SETTING THE MAIN LINE. 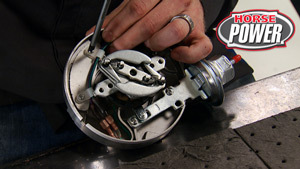 (ERIC)>> THAT'S REALLY THE CENTER OF THE ENGINE. IT'S WHERE ALL OF YOUR OTHER MEASUREMENTS ARE TAKEN. THEN IN GOES INTO A FOUR AXIS CNC MACHINE SO THAT WHEN WE GO IN AND CUT THE DECK, IT'S PERFECTLY PERPENDICULAR TO THE MAIN LINE OF THE ENGINE. AND THEN WHEN THE CYLINDERS ARE BORED, IT ACTUALLY KNOWS NOT ONLY WHERE THE CENTER LINE OF THE CYLINDER THAT IT'S BORING IS, BUT IT ALSO WHERE THAT CENTER LINE IS RELATIVE TO EVERY OTHER CYLINDER IN THE ENGINE. IT'S BEYOND BLUE PRINTING. (JOE)>> THE TECHNOLOGY HERE IS SECOND TO NONE. THEY EXTENSIVELY USE A FOUR AXIS CNC MACHINE, AND EVEN AN EPOCH CONTOUR SINGLE POINT CUTTER FOR VALVE JOBS. (ERIC)>> IN THE OLD DAYS WHEN THEY TALK ABOUT THEIR RACING FIVE ANGLE VALVE JOB, THIS THING PUTS 99 DISCRETE ANGLES ON THE SURFACE OF THE VALVE SEAT. (ERIC)>> THIS GOES INTO A SOFTWARE THAT GIVES US THE ABILITY TO ANALYZE THINGS LIKE THE HARMONICS. IS THE VALVETRAIN BEHAVING AS IT SHOULD? IS THE VALVE HAPPY, IS IT OPENING AND CLOSING LIKE IT SHOULD OR DOES IT BOUNCE WHEN IT HITS THE SEAT? (JOE)>> BUILDING NASCAR ENGINES INVOLVES STRICT LIMITATIONS ON ENGINE SIZE, BORE, STROKE, AND SO ON. 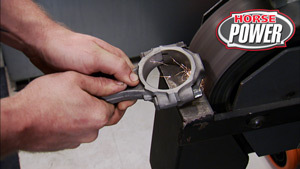 SO ARRINGTON'S ENGINE GUYS HAVE ALWAYS FOCUSED ON REDUCING FRICTION IN THE NAME OF POWER. 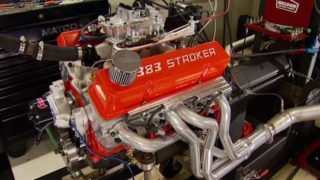 (ERIC)>> WHEN THAT ENGINE IS BUILT RIGHT ON THE NUMBERS, THAT LOW FRICTION MEANS YOU'RE NOT SPENDING YOUR POWER FORCING THE ENGINE TO TURN OVER AND YOU'RE LETTING THAT POWER OUT THE END OF THE CRANK SHAFT. (MIKE)>> THE MANLEY CRANK WAS DESIGNED WITH ARRINGTON AND IS FOR A TRUE 426 INCHES. IT'S FORGED STEEL AND HOUSES THE OIL PUMP DRIVE AND A RELUCTOR WHEEL FOR CRANK POSITION. IT HAS A 4.080 STROKE, IT'S KEYED FOR THE BALANCER, AND SPINS ON CLEVITE BEARINGS. NEXT INSTALL THE TWO PIECE THRUST BEARING, AND HOLD IT ALL IN PLACE WITH ARRINGTON BILLET MAIN CAPS AND ARP STUDS. AN ENGINE BUILDER. 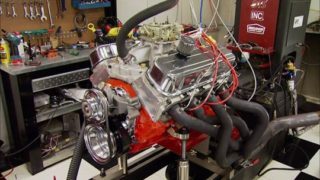 CHRIS MARTIN'S BUILT THOUSANDS OF HEMI RACE ENGINES. HOW MANY HAD AN OLD TIME 871 BLOWER? (CHRIS)>> WELL THIS WILL BE THE FIRST ONE THAT WE BUILT LIKE THAT. (JOE)>> YOU NERVOUS ABOUT THAT? (CHRIS)>> NOT A BIT, I THINK IT'S GONNA TURN OUT JUST FINE. I'VE GOT ALL THE CONFIDENCE IN THE WORLD. FOR UP TO ABOUT 14 POUNDS OF BOOST. IT'S FULLY COATED WITH A LITTLE EXTRA ON THE SKIRTS. NOW YOU CAN ONLY ORDER THESE THINGS THROUGH ARRINGTON AND THEY'RE EQUIPPED WITH A SET OF MOLY RINGS. THE RODS ARE MAINLY HBEAMS, HELD IN PLACE WITH ARP 2,000 BOLTS. CHRIS IS TORQING THEM TO 90 FOOT POUNDS. THEN USES A STRETCH GAUGE TO ENSURE FIVE TO SIX THOUSANDTHS STRETCH. (JOE)>> THE ROLLER CAM SPECS OUT AT 225 INTAKE, 234 EXHAUST AT 50 THOUSANDTHS LIFT. LOBE SEPARATION ANGLE IS 114, AND IT'S HELD IN PLACE WITH A STOCK MOPAR TENSIONER. AFTER THE TIMING CHAIN AND RELUCTOR WHEEL ARE IN PLACE, WE CAN PULL THIS PIN TO RELEASE THE TENSIONER. WITH THE OIL PUMP INSTALLED ALONG WITH THE PICK UP WE CAN BOLT UP THE TIMING COVER. THIS WINDAGE TRAY DOUBLES AS A GASKET, AND THIS CANTON OIL PAN HAS A DESIGN THAT WILL CLEAR THE CAR'S CHASSIS. 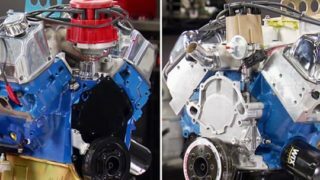 ALL THIS GETS US A BIG STEP CLOSER TO HAVING A BAD BLOWN HEMI FOR MUSCLE CAR'S DART. LOCATORS TO SUPPORT CAMS WITH UP TO 625 VALVE LIFT. THESE PORTS ARE CNC'ED WITH PROGRAMS THAT WERE DEVELOPED BY THEIR IN HOUSE ENGINE BUILDERS. 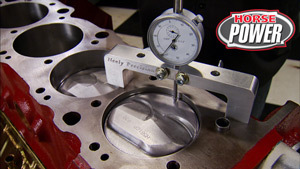 THEY USE NASCAR STYLE HEAD GASKETS, ESPECIALLY MADE FOR ARRINGTON BY COMEDIC. ACCORDING TO ARRINGTON'S IN HOUSE TESTING, THESE PHASE FOUR HEADS OUTPERFORM COMPETITOR'S HEADS BY 18 HORSEPOWER. THE NEXT PARTS ARE THE HEMI PUSH RODS, ALL 16 OF THEM. THE ROCKER ARM SHAFTS ARE DIRECT REPLACEMENTS. HOWEVER THE ROCKER'S THEMSELVES ARE DESIGNED AND MACHINED BY ARRINGTON WITH PROPRIETARY STEEL TIPS. FOR VALVE COVERS WE'RE BOLTING ON A PAIR OF OEM'S WITH COIL PACKS. (JOHN)>> NOW IF YOU'RE WONDERING HOW WE'RE GONNA ACTUALLY FIT THIS OLD SCHOOL BLOWER ON THIS NEW STYLE MOTOR, IT'S NOT GONNA BE AS HARD AS YOU THINK. INDY OFFERS WHAT THEY CALL THE MOD MAN INTAKE. NOW THEY HAVE ONE FOR A FIVESEVEN AND A SIXONE, AND IT'S MACHINED FOR ALL THE BOLT PATTERNS TO GO WITH THEIR ADAPTER PLATES. YOU CAN GET ANYTHING FROM A SINGLE FOUR, FUEL INJECTION, TWO FOURS, ALL THE WAY UP TO THE BLOWER LIKE OUR CASE. NOW ONE THING YOU'RE GONNA HAVE TO PAY ATTENTION TO IS THEY DON'T COME WITH A PROVISION FOR A BLOW OFF VALVE. NOW I DID THIS ONE AT A BUDDY'S SHOP LOCALLY. YOU CAN HAVE YOURS DONE FOR PROBABLY ABOUT $75 DOLLARS. DON'T FORGET IT OR YOU'RE GONNA BLOW YOUR MOTOR UP BEFORE YOU GET STARTED. 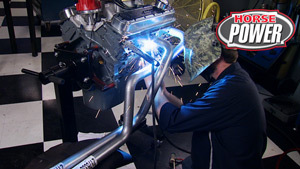 (JOE)>> WITH A COUPLE OF GASKETS IN PLACE WE CAN CINCH DOWN THAT INTAKE AND GET READY FOR THE NEXT STEP. THE BLOWER, NOT YET! BOOST TO ENSURE THE RINGS SEAT PROPERLY. NOW ONCE WE'RE COMFORTABLE, WE'LL GO AHEAD AND DYNO THIS THING AT FULL RPM'S TO SEE WHAT IT DOES NATURAL ASPIRATED. A SPACER, AND WE'LL FEED IT WITH 93 OCTANE FUEL. WITH BOTH CARBURETED AND EFI ENGINES. FOR HEADERS ARRINGTON LOANED US THESE, SPECIALLY DESIGNED FOR DYNO ONLY USE. NOW WE CAN PUMP IN SOME BREAK IN OIL AND MOVE ON TO TIMING. OUR MSD USES COMPUTER SOFTWARE AND COMES WITH A BUILT IN TIMING CURVE TO GET YOU STARTED. FROM THERE YOU CAN MODIFY IT TO GET THE MOST OUT OF YOUR APPLICATION. ALRIGHT, YOU READY? (MIKE)>> OH YEAH, LOOK, IS THAT A GAP? IT'S COMING FROM UNDER THE SPACER. NO BIG DEAL, WE'LL JUST TRASH IT AND THROW ON A REPLACEMENT. THAT SHOULD DO IT. (JOHN)>> LET'S SEE WHAT HAPPENS. (MIKE)>> ALRIGHT JOHN, HERE WE GO! (MIKE)>> MUCH MORE LIKE IT. NOW WE CAN CONTINUE THE BREAK IN TO MAKE SURE OUR RINGS AND BEARINGS FEEL AT HOME. ( )>> THEN IT'LL FIT INSIDE. (MIKE)>> AFTER 40 HOURS OF BLUE PRINTING AND CUSTOM MACHINING AT ARRINGTON PERFORMANCE, WE STARTED THIS BUILD WITH ONE OF THEIR GEN THREE BLOCKS, FILLING IT WITH SPECIAL PERFORMANCE PARTS INCLUDING A FORGED CRANK, PISTONS, AND RODS. NOW WE POKED IN A NEW ROLLER CAM AND BOLTED ON A SET OF ARRINGTON'S ALUMINUM HEADS. AFTER A CARB ONLY WARM UP SESSION. (MIKE)>> IT'S TIME TO PUT THIS 871 HUFFER ON THE HEMI. THAT HAS ADDITIONAL BOLT HOLES FOR ADDED INSURANCE. THE BLOWER MOUNTS TO EIGHT STUDS ON THE PLATE. IN ADDITION TO A BLOW OFF VALVE, THESE ARP STUDS ARE DESIGNED TO BREAK IN THE CENTER IN THE EVENT OF A BACK FIRE. (MIKE)>> FOR FUEL DELIVERY AND EXTRA RETRO LOOKS, TWIN HOLLEY 950 CARBS WITH A LINKAGE KIT DESIGNED ESPECIALLY FOR THEM. NOW THESE ROOTS BLOWER CARBS HAD BOOST REFERENCE POWER VALVES THAT WORK OFF OF INTAKE MANIFOLD VACUUM. ALL THAT'S LEFT IS FUEL LINES FOR 93 OCTANE, BOLTING ON THE PULLEYS, AND SLIDING THE BELTS INTO PLACE. BY NOW WE'RE STARTING TO FEEL A LITTLE EDGY. AFTER ALL, BUILDING AND RUNNING THIS OLDNEW COMBINATION IS A FIRST FOR US AND FOR ARRINGTON'S THIRD GEN HEMI. (JOHN)>> GOOD HERE, GOOD HERE, GOOD HERE, GOOD HERE, GOOD HERE, GOOD HERE! (JOHN)>> ALRIGHT BACK END FOR THE POWER VALVES IS GOOD. 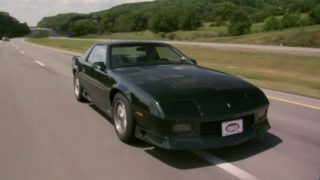 (MIKE)>> 690 HORSEPOWER, 655 FOOT POUNDS OF TORQUE. GRAPH, THE POWER CURVE'S AWESOME. THAT TORQUE THOUGH MAN, IT PEAKS, IT PEAKS GOOD. (JOHN)>> THEY'RE GONNA HAVE TO HOLD ON. (MIKE)>> THIS THING IS DIALED IN. WE'D BE CRAZY TO START MESSING WITH ANY OF IT, BUT WE CAN PLAY WITH IT. TOMMY CAME OUT TO PLAY TOO. (TOMMY)>> I REALLY THINK I COULD SIT HERE ALL DAY AND JUST SIT HERE AND PLAY WITH THIS. THIS VIDEO GAME ROCKS MAN! (MIKE)>> NOW LETS LOOK AT THE AVERAGE. 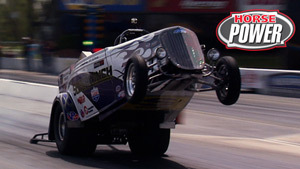 (MIKE)>> 521 ON POWER, LOOK AT THE TORQUE. FROM 2,500 TO 6,500 606 FOOT POUNDS OF TORQUE THROUGH THE RANGE. THAT'S A GOOD AVERAGE. OH THAT'LL PULL THE FRONT END OF THAT CAR UP WITH THEM BIG TIRES. YOU'LL NEED TO KEEP AN EYE ON MUSCLE CAR FOR THAT, CAUSE FOR NOW OUR JOB IS DONE. (ANNOUNCER)>> JUST AHEAD JOHN'S GOT A TECH TIP ON HOW TO FIND AN ENGINE MISS WITHOUT LOSING A LOT OF CASH. IT'S A BUDGET FRIENDLY WAY TO TROUBLE SHOOT YOU DON'T WANT TO MISS! (JOE)>> IF YOU'VE GOT ONE OF THE BIG THREE'S LATE MODEL MUSCLE CARS, THIS COULD BE THE BEST AFTERMARKET MOD FOR IT. IT'S THE NEW IN TUNE TUNER FROM DIABLO SPORTS. NOW IMAGINE PRELOADED PERFORMANCE AND ECONOMY TUNES FOR GAS OR DIESEL, ONE PART NUMBER. IT'S GOT A COLOR TOUCH SCREEN WITH WHAT THEY CALL TUNING SIMPLIFIED, FREE ONLINE UPDATES FOR LIFE, EVEN BUILT IN AUTOMATIC UPDATE SOFTWARE. OF COURSE YOU CAN CUSTOM TUNE FOR OTHER PERFORMANCE UPGRADES, CATALOG REAL TIME OBD TWO DATA, PLUS ADJUST FOR A TON OF PARAMETERS. THAT'S QUITE A LOT FOR SUCH A SMALL DEVICE WITH A PRETTY SMALL PRICE TOO, LESS THAN $390. (JOHN)>> SOLVING AN ENGINE MISFIRE CAN ACTUALLY MAKE FOR SOME PRETTY SERIOUS DETECTIVE WORK SOMETIMES. OR IN SOME CASES COIL PACKS. OBVIOUSLY WE'VE GOT A BAD WIRE. SO AFTER A QUICK, CHEAP SWAP, PROBLEM SOLVED. OKAY, WE SHOWED YOU HOW TO DIAGNOSE A CYLINDER MISFIRE WITH NOTHING MORE THAN A USED WATER BOTTLE AND A LITTLE BIT OF TIME. TO LOOK FOR BY SIMPLY OPENING THIS VALVE UP. 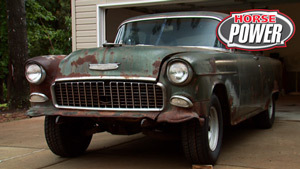 IF YOU'VE GOT AIR COMING OUT OF THE CARBURETOR, YOU KNOW YOU'VE GOT AN INTAKE VALVE PROBLEM. NOW THE EXHAUST SIDE. WITH THE EXHAUST VALVE CRACKED OPEN, YOU CAN SEE THE AIR COME OUT OF THE EXHAUST. PRETTY COOL, EH? WELL IF THE COMPRESSED AIR WAS ACTUALLY CAUSING BUBBLES IN THE RADIATOR OR WE HAD SOME MILKY LOOKING OIL, CHANCE ARE WE'VE GOT A BLOWN HEAD GASKET. SO THESE ARE SOME STEPS FOR YOU TO DIAGNOSE THE PROBLEM YOURSELF WITH SOME CHEAP TRICKS AND SOME SPECIALTY TOOLS. AND WITH A LITTLE BIT OF TIME, YOU WON'T WASTE A WHOLE BUNCH OF HARD EARNED MONEY ON PARTS YOU NEVER ACTUALLY NEEDED.